If he was a girl. If it’s the safest place for him. Living abroad automatically enrolls me in an online course of “Race Relations in America in the Presumed Post-Racial Era.” In the seven months of my course work, I’ve been reintroduced to some invaluable lessons. 1. Black men are seen as inept, incapable, ill-equipped, inferior, invisible “boys” when it comes to standard allowances for the majority such as personal or commercial loans, employment, or scholastic admissions and scholarships. 2. Black boys are seen as dangerous, threatening, thuggish, lethal “men” when it comes to justifying their murders with erroneous claims of self-defense. 3. White men, women, and children can and will be justified and excused for any infliction or infraction upon someone black or brown, and if they’re wealthy, any infliction or infraction period. If any action of systemic justice is taken such as an indictment, it will be far-reaching and unattainable to convict so as to pacify the cries of the oppressed. 4. Black men, women, and children will not be justified or excused in any infliction or infraction period. 5. Black and brown children are not allowed to be children, to engage in frivolous activity, to be seen as innocent, to be mischievous or given the opportunity to mature and evolve as their white counterparts are. 6. Self-defense only applies to the majority culture. This includes any that have assimilated to the point of being mistaken as a member of the majority culture. Black people are not allowed to feel and act with fear because they are only to be feared. 7. It’s worse in the south. 9. White entitlement, which is an intoxicating and debilitating drug that can be inherently or mistakenly consumed by anyone, will lead to the following when any minority voices they want to empower themselves: they will NOT want you to advance in this way; they will feel entitled to voice their opposing opinions in any forum, even yours; they will always play the victim; they will try to beat you over the head with insults and accusations, specifically that you, the oppressed party, are racist; they will not offer support; they will feel threatened and offended by any thought you have to progress your own as the majority culture has done since the inception of this country; they will not take kindly to any encroaching on their way of life; they will try to steal, kill, and/or destroy you, your ideals, your culture, & your identity. 10. Many educated or influential, middle class or affluent Black people will be afraid to recognize or SPEAK on these matters in fear of disturbing their individual lives of contentment and complacency. Those of us who do will be marred even by our own. So is the price of reading of, thinking for, and loving oneself. I was aware, but did not fully digest the reality of the aforementioned when I actually dwelled in the midst of it. I was honestly somewhat afraid of truly SPEAKing the truths of my experience for fear of ruining relationships, ostracizing myself, or jeopardizing the safety of those I love. (See number 9.) Now, I realize we are all in jeopardy. Our lives are already vulnerable because they are seen as disposable. Our rights to humanity have already been stripped for many, and can be from us all at any time. We have not progressed nearly as much as we have fooled ourselves into believing. What else do we have to lose? Now, is the time to pool together to focus on what we have to gain. My husband and I have engaged in many discussions about restoring our culture and community within the states. Our ancestors literally slaved to build a country that has continually terrorized us as its inhabitants. It’s time we do something, well within our rights, about it. 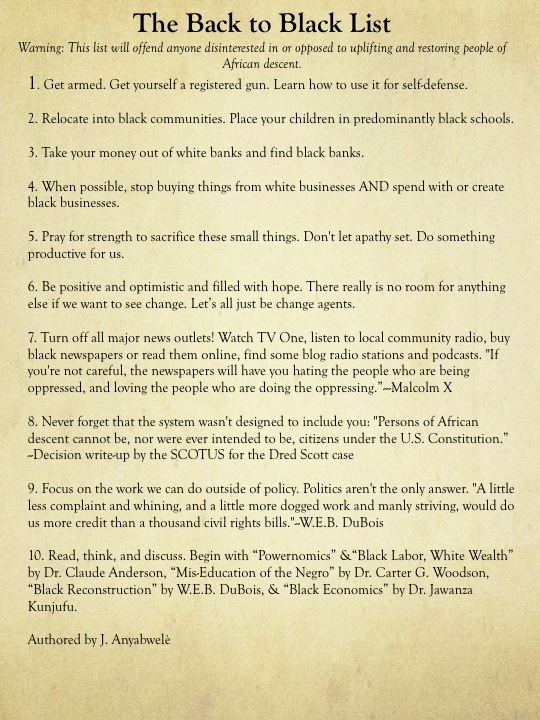 He has compiled a list, an action plan if you will, that can and should be implemented by all who are focused on rebuilding and restoring black economy, black neighborhoods, black greatness. Loving ourselves and wanting to support our own, just like all other cultures do already, does not mean we hate anyone else. There is no room or energy for hate. We have to know and understand this first. I know posts like this will meet with opposition, and I no longer care to entertain it. Again, those who are intoxicated with supremacy will feel ENTITLED to speak even when they are not addressed at all. These things will apply to any one in opposition, regardless of race. Knowing these things, we must remain focused. We can lovingly educate those who are genuinely interested in our cause, but we will not engage in useless banter. We give credence to their voice when we do. If you are in disagreement with the purpose of this post and the following action plan, feel free to keep moving. We’ve got work to do here. For those who are wondering what to do now that it has been repeatedly confirmed that our lives have no value. This list is already being implemented by other cultures, the majority culture in America especially. The oppressed cannot be racist, because we hold no economic power. Be not distracted by the intoxicated.